Cheerleader coaches' apparel is often subject to a stereotypical look. Coaches will frequently sport the same warm-ups as the team they are coaching. The image of the stern looking coach in sunglasses and an oversized nylon jacket is pervasive within the cheer world. However, some coaches are breaking the mold and including more styles into their game repertoire than the classic ill-fitting warm-ups. The fans in the bleachers aren't necessarily plugged into the coaching aspect of cheerleading. The cheerleading squad is typically the focus of any off-court or off-field excitement. Hence, most cheerleading coaches aren't terribly concerned with the aesthetic appeal of their game apparel. This is why nylon warm-ups remain common apparel within the coaching realm. Coaches usually borrow concepts from and design their coaching-wear in the same style as their squad. On game days, coach warm-ups are often matched to those of the team with the small modification of the word "Coach" monogrammed into the upper-left quadrant of the jacket. If you are a cheerleading coach seeking to blend in with the system, then your best bet is to choose your apparel based on the practice-wear and outerwear worn by your squad. If your team has a heavily customized wardrobe, then there are even more options when choosing what aspects of the team uniform to include into your own repertoire. 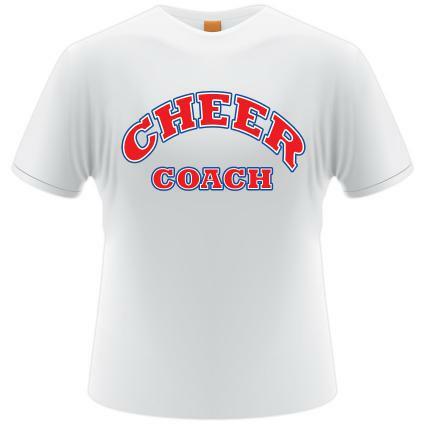 Naturally, all of the items can be personalized for a cheerleading coach simply by having the label "Coach" stitched onto the clothing article. These monograms are very common and appropriate as some coaches appear young and fit enough to blend right in with their squads. On game days, at least one article of a coach's apparel should be matched to the squad. The easiest of these items is a windbreaker or warm-up jacket. On hot days, many coaches will pair a basic white tank with the team's warm-up pants. Regardless of fashion options, a coach's ability to represent the squad is vital to her recognition. Coaches' apparel does not need to be dowdy and masculine. Fitted yoga pants can create a more hip look than the standard oversized warm-ups. When paired with a warm-up jacket, at least half of the frump-factor can be eliminated. On practice days, items that are fun and personalized for coaches can add a little thrill to a wardrobe. Head2ToeCheer.com can provide a decent selection of coaches' apparel that goes beyond the baggy-pant syndrome. Yoga pants and cute colorful capris that can also be coordinated to match team colors are available. Be forewarned that Head2ToeCheer suffers in the department of tops, as there is little selection beyond the classically stern-looking polo. If a coach's desire is to sport a monogrammed version of her team's warm-ups, then the place to obtain such items will depend on what company and catalog option was chosen to outfit the squad. Cheerleading coaches face similar ordeals as their team when it comes to choosing a uniform. Game days can include sweltering hot afternoons and freezing evenings, so a coach's apparel will need to consist of several options that can accommodate changes in weather. Warm-ups can be versatile when paired with tanks and shorts, but it is always best to plan for the cheer year with more than just a few clothing changes. Purchasing soft white tanks and tees such as those made by Splendid can help to increase your game day comfort and give you a pleasant shift from the classic team-related polo or the "Number 1 Coach" T-shirt. Moreover, some companies such as the renowned Varsity.com are offering weather-related gear to aid teams and coaches in the event of more severe climates. These little accessories or wardrobe considerations can help to make your coaching more convenient and comfortable!